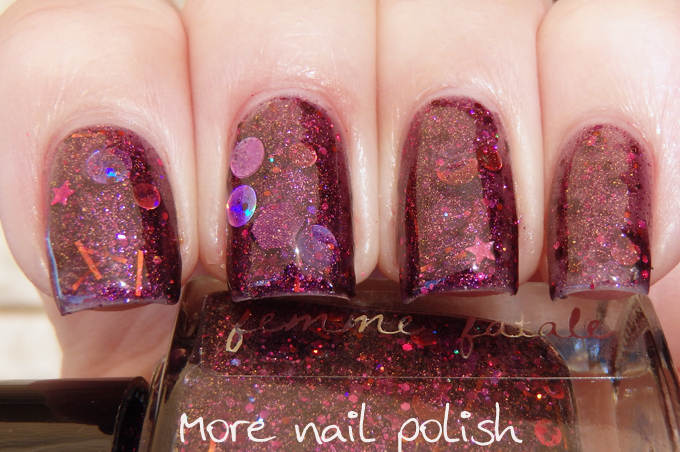 I have two new glitters polishes from Femme Fatale Cosmetics to show you tonight. 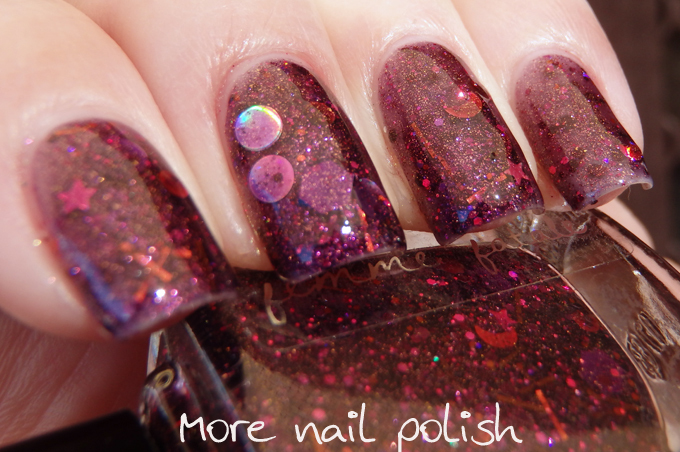 This duo of polishes, released for Halloween, is released tomorrow. 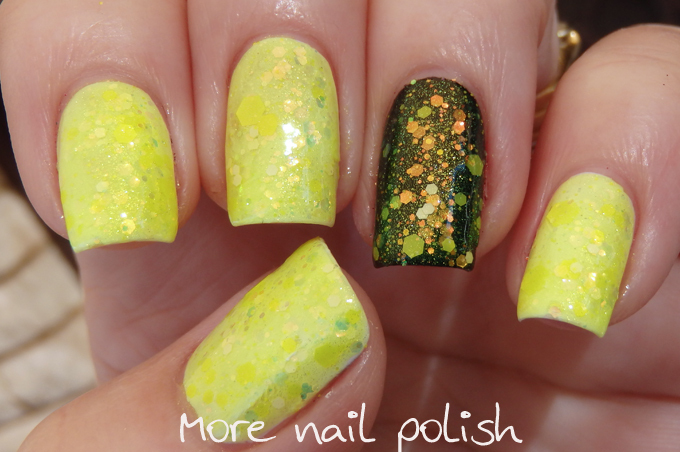 Time for Slime - This one is a bright lime leaning yellow. It has white, yellow and iridescent glitters in a bright yellow jelly base. This is too sheer to wear on it's own, so you will want to layer it over something. It looks awesome over both white and black, over white you see the yellow glow, but over black you really see the iridescent glitters. 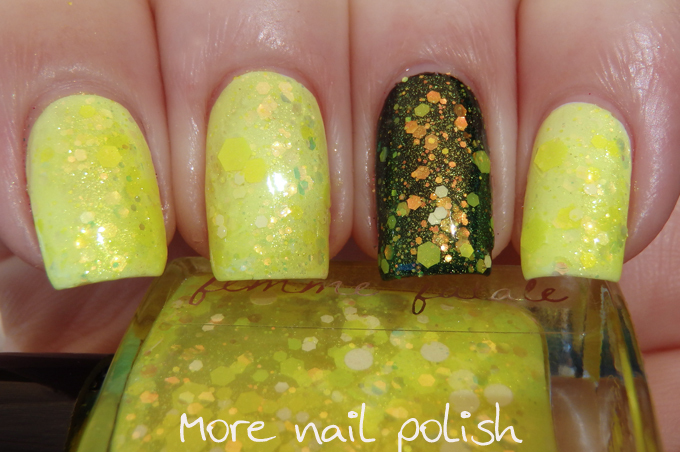 I really want to try this over a darkish blue, as the yellow base will make a gorgeous teal colour with glowy glitters. This is two coats over white and black with Seche Vite top coat. 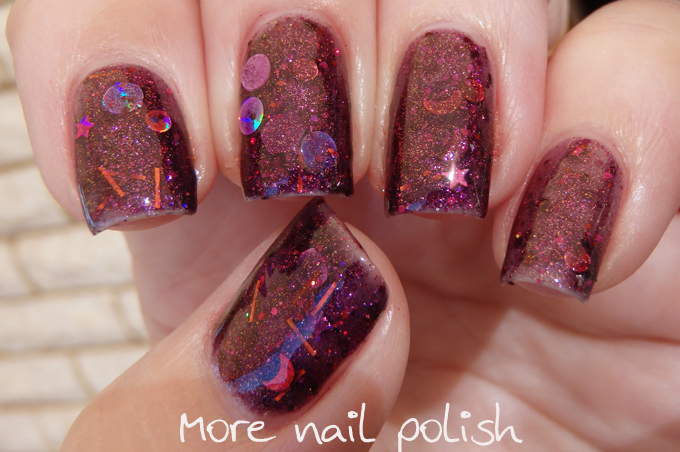 Witching Grimoire - This is a complex mix of pink, red and maroon glitters ranging from tiny micro glitters up to very large hexes, holo circles, tiny stars, moons and bar glitters. Considering the range of different shaped glitters, that wasn't actually that difficult to get on, or to smooth out. 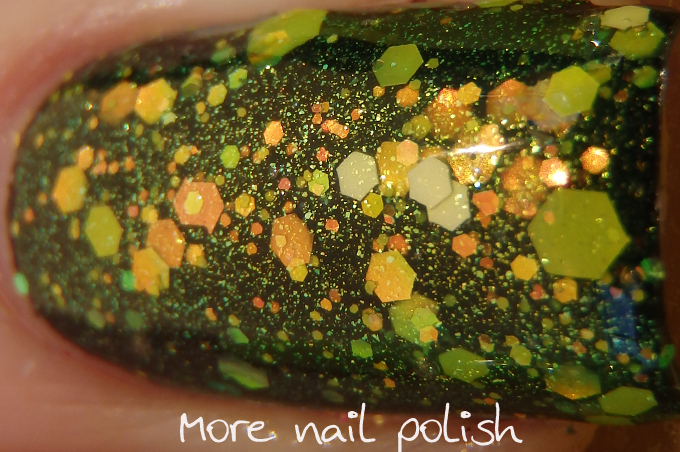 Because of the mix of glitters, it would probably be best layered over a base, but I did three thin coat to show you it on it's own. 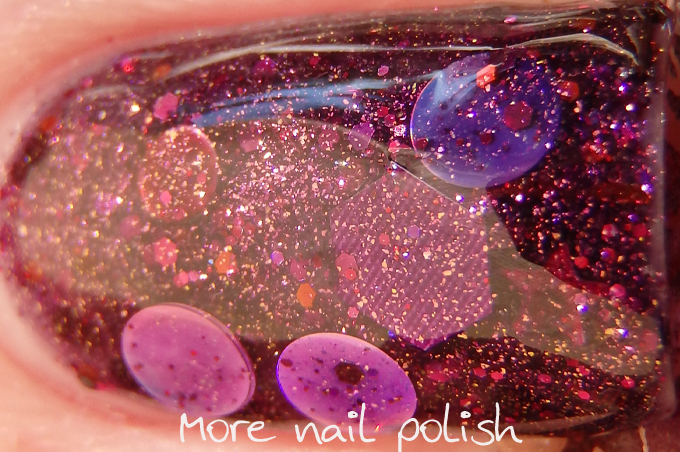 Topped with one layer of Seche Vite. I didn't know what a Witching Grimoire was, so I Googled it. I'm guessing Sophie from FF is a bit of a World of War craft gamer. I've not got into any of these games, although I know I would love playing them as I've seen how much my mum loves playing Ever-Quest, Landmark and a bit of WoW. She has even got my kids into playing Ever-Quest with her assistance. I've seen them flying around on pegasuses, and they refer to it as 'playing the horsey game'. 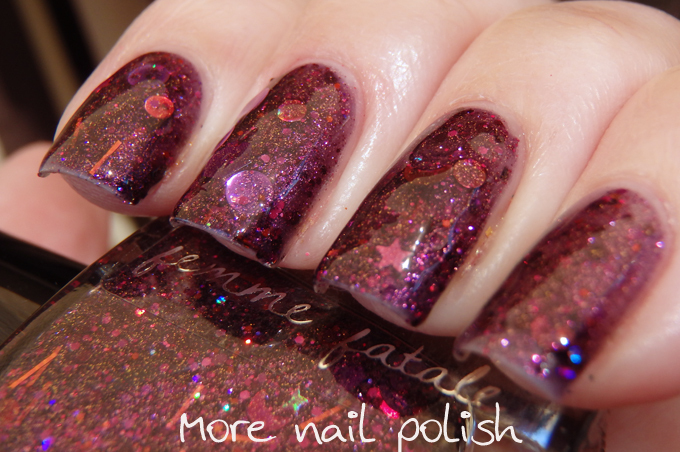 The Femme Fatale Halloween duo will be on sale tomorrow from Femme Fatale Cosmetics. Love Time for Slime, your idea to layer it over a dark blue is genius. Your mom sounds awesome! Hee hee, my mum is awesome. I think it's pretty awesome that she's in her late 60's, she's an online gamer, and she paints and stamps her nails with awesome designs. Time for Slime looks very cool, I prefer it over black but I also really like it over white! Time for Slime looks great over black!